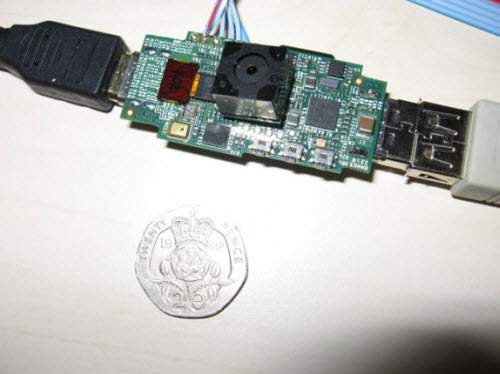 $25 Computer Runs Linux on USB stick - Asterisk on a Stick? Imagine being able to carry a PC on your keychain, well imagine no more! David Braben a game developer invented a skeletal computer on a USB stick that runs Linux (Ubuntu), and gets you connected to the Internet. This tiny USB stick PC sports a HDMI port on one end and a USB port on the other. It comes equipped with a decent 700 MHz ARM 11 processor, 128 MB of RAM, a USB port, support 1080p video and the ability to add a webcam or WiFi module. All this for $25. Definitely could be a game-changer, especially in the developing world, i.e. One Laptop Per Child. Also check out the Raspberry Pi Foundation website involved with this project.